The Kodandarama Temple is situated in Hiremagalur, which is a town in the Chikmagalur district. This temple seems to have been constructed in several stages. It is now under the state administration. It is believed that nine siddhas performed penance here, so the village pond is known as Siddha Pushkarini. Parashurama, an incarnation of lord Vishnu, is believed to have lived here, so the town is also known as Bhargavapuri. The Garbhagraha and Sukhanasi were constructed in the Hoysala style, while most of the other constructions are in the Dravidian style. The navaranga and mukhamandapa were later additions. These are surrounded by a wall made of brick and mortar. Inside the sanctum, on a Hanuman pedestal, there are the figures of Rama, Lakshmana and Sita. Unusually, Sita is placed to Rama’s right in this temple. It is believed that a devotee Puroshottama expressed a wish to see Rama and Sita’s wedding and he was granted the wish. As the bride in traditional Hindu marriage sits to the right of the groom, this position, it is believed, is reflected in the Garbhagraha. Rama and Lakshmana are depicted with their bows and arrows here. As Rama’s bow is called Kodanda, this temple is known as Kodandarama Temple. 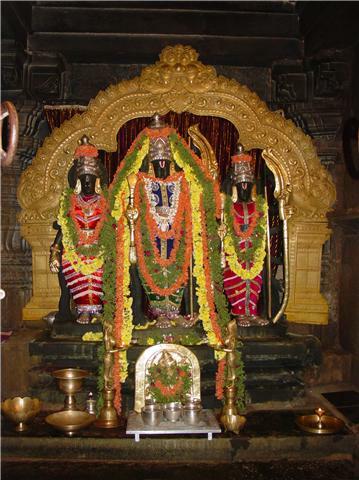 In the prakaram there are small shrines for Yoganarasimha, Sugriva, Kalinga Mardhana Krishna, Ramanujacharya, Madhvacharya ad Vedanta Desika. A four foot-high figure of Yoganarasimha has a Prabhavathi on which are sculpted the ten avatars of Lord Vishnu. The outer walls of the Garbhagraha and Sukhanasi are sculpted with figures of the various forms of Vishnu like Hayagriva, Narasimha, and Krishna. There are also figures of Lakshmi, Hanuman, Garuda and Ganapati. Chikkamagalur is located at a distance of 250 km from Bangalore. Get a bus to Chikamagalur, and from there, you can take a bus to Hiremagalur.